A gray wolf. Most gray wolves are affiliated with a pack, which patrols and maintains a marked territory, defending it from neighboring packs and unaffiliated wolves. To a pack, territory means food and den sites — in short, survival. Territory violations by members of neighboring packs and unaffiliated animals are seen as threats to survival, and often result in fights to the death. This mechanism helps ensure a healthy balance between predator and prey populations. 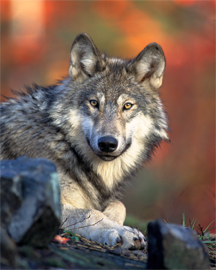 More about the gray wolf from the Wisconsin Department of natural Resources. In the workplace, animosity can serve a similar function. When a particular organization becomes too crowded with people of similar ambitions, contention can result in displacement of some to other organizations. Although animosity can serve such a constructive role, the price in terms of lost productivity and depressed morale can be very high. Unlike the gray wolf, humans are capable of devising alternative mechanisms perhaps better suited to distributing talent. Photo courtesy U.S. Fish and Wildlife Service. The causes of animosity between two people might be outside the awareness of bystanders, or even outside the awareness of either party or both. But animosity usually has roots somewhere. One common explanation for animosity between two people — overused, I believe — is a "personality clash." But animosity can arise from other sources. For example, it can be structural, arising when the people involved represent groups that are in a state of toxic conflict. And animosity can be a tactic — created by one or both parties, who might use animosity to achieve an undisclosed goal. When animosity is a tactic, addressing it as anything else probably won't work. Here's a little catalog of animosity patterns I've seen people use. It might help you recognize when animosity is a tactic. Sometimes the actual target of the operator isn't obvious. For example, if the actual target is a team lead, and the operator hopes to displace the team lead, the operator might target someone else to create dissension, providing evidence that the team lead is ineffective. This tactic works better when the dissension created doesn't involve the team lead directly. Disrupting a team's social structure can be one route to becoming a dominant figure on a team. The disrupter gradually antagonizes the current dominant figure, intending to force what appear to be unforced errors. Flustered, dominant figures under such attack might commit blunders serious enough to compromise their positions, and the displacement is then complete. This approach is more effective when the current dominant figure champions noble, higher ideals. Some believe that all their relationships must be pleasant and cheerful. Their willingness to bend is what many would term "beyond reasonable" or even "self-destructive." They're easy targets for those who use animosity as a tactic. By creating tension in the relationship, the operator can use it for all manner of workplace favors, such as freeing up assignments or obtaining political support for their endeavors. else probably won't workuse animosity to discredit potential competitors. By creating difficulty between the competitor and those around him or her, they create the impression that the competitor is difficult to work with. This approach is more effective if the operator is especially productive and ingratiating to the shared superior. In some cases, the operator actually becomes the superior's close confidant. Would you like to see your comments posted here? rbrenqlDYuErEEGJGSRVLner@ChacNsfmVHRJUqpmSSkFoCanyon.comSend me your comments by email, or by Web form. See also Conflict Management, Emotions at Work and Workplace Politics for more related articles. I offer email and telephone coaching at both corporate and individual rates. Contact Rick for details at rbrenLVzJXMRjJKOaGfuAner@ChaclqlOgcLpvDFDbYwIoCanyon.com or (650) 787-6475, or toll-free in the continental US at (866) 378-5470.